We study these processes in the electrosensory system of weakly electric fish, using a combination of behavioral, electrophysiological, and computational neuroscience approaches. 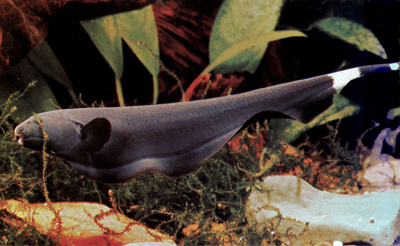 The animal to the left is a black ghost knifefish (Apteronotus albifrons). These nocturnal fish generate a weak (millivolt-level) electric field, which they use to detect objects in the dark. They use this ability, called active electrolocation, to hunt and navigate at night in freshwater rivers of South America. We study how weakly electric fish acquire information about their surroundings using the electric sense.